Torbay Global Geo Park, also known as the English Riviera Global Geo Park is a wonderful large area of landscape and seascape with its own unique geology. It is an ancient land therefore covers many geological periods. Look around at it all, beautiful isn't it. The area has changed over the millennia and it is all those changes that have given us the beauty we enjoy today. 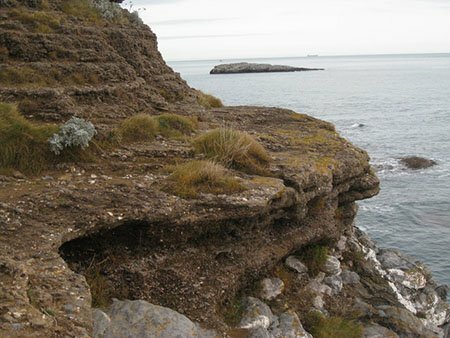 The Geopark itself was declared in 2007 and covers over 6000 hectares of land and over 4000 of that seabed out there. This was once the beach! Now it is about 8 metres above the sea!!! All these special areas, Areas of Outstanding Natural Beauty, Areas of Special Scientific Interest, World Heritage sites etc - so what on earth are Geo Parks I hear you ask. Geo Parks are areas of special geological and often archeolagical history and interest, caves, the rocks on the land and on the seabed. What has made the really beautiful landscape that has been sculpted through aeons of differing climates, upheaval and weathering. It really is special. There are eight Geo Parks in the United Kingdom, two in Scotland, Shetland and the North West Highlands; two in Ireland, Marble Arch and the Copper Coast; two in Wales, Geo Mon Anglesey and Fforest Fawr; plus two in England the North Pennines and Torbay global Geo Park of course. There are 89 worldwide!!! Was once the Guard House of the Fort. 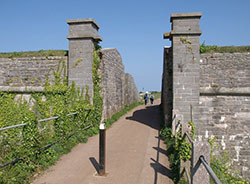 There are three Gateways to Torbay Global Geo Park, all very interesting spots. Kent's Cavern which is both an archeological and a geological gateway. It is quite a good idea to start here and have a look round the Cavern to get an insight, then wander round the circular walk. It is beautiful. Kent's Cavern is open all the year round and there is a cafe for a cuppa. Berry Head National Nature Reserve. Lovely place. Stunning views!!! Impressive and dramatic, 400 million years old. Lots of wildlife. 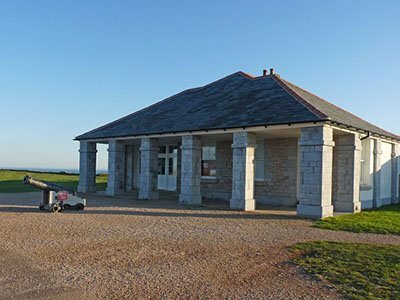 Has a new Visitor Centre and cafe. Recently the Napoleon War fortifications were restored. During the Napoleonic War this must have been a superb lookout! Has actually been a lookout from the Iron Age to the Cold War! The Seashore Centre. Can be found at Goodrington Sands, Paignton. It has seawater tanks with marine life and interactive seashore displays. It is quite a good idea to visit all three to get a really rounded vision of geological and archeological changes for this unique area. Not of course necessary to visit all three in the same holiday!!! Make great days out too. The South West Coastal Path, Meadfoot. Another good idea for an appreciation of the geology of this coastal area. Not that one could do it all at once - it is 600 miles long!! It runs from the Jurassic Coast of Dorset, along the Devon coast, round the Cornish coast to Minehead in Somerset. One can do it in bite sized bits and get some great days out. Stunning views. Was once the pathway for the coastguards hunting for smugglers. Now run by the National Trust. Torbay Global Geo Park - It was not always here!!! Continental drift and crashes of landmasses into each other have caused the land of the world to move about quite a bit and what was once the other side of the world can now be in a quite different place! Collisions of continents and volcanoes have erupted the surface of the earth into mountains, hills and valleys. Continental crashes can be felt thousands of miles from where they happen. Weathering over aeons have worn away some of what was once there. Ice Ages have come and gone, sculpting the hills and valleys of the earth. So that here in this lovely part of the world there is a mix of many geological changes. Devon has given its name to the very early rocks in the area, the Devonian. They were followed by the volcanoes that made the early rocks rise and gave rise to the Carboniferous era. The Permian age was the next one and results from when this land was part of a desert around the same distance from the equator as the Sahara Desert in north Africa. Iron sediments give the sand that red shade. Later ages have left their mark too. Deposits continued to be laid and worn away. The collision of Africa and Europe left cracks of the earth's crust in the area. One can only wonder at the pressure of the stress and tension such a collision would cause!!! Seas have risen and fallen over the same long period of time and now in this area where that sea bed is now was once a wooded valley that was so suited to the hunter gather lifestyle of the first humans in the area. Animals and plants have changed over the millennia too. They would have fitted the climate and landscape of the region in which they were. Bears and mammoths roamed around Torbay! Think a minute - could your extended family organise a successful large animal hunt!! The early humans did and with their more limited tools!! Do not underestimate the intelligence of our ancient ancestors. Without what they worked out we would not be where we are today. They fashioned bone, wood and stone into tools for hunting and domestic use. They sorted out how to work and use the plants and the hides of the animals they caught for clothing. As things evolved fire and farming etc. Pretty marvellous really! 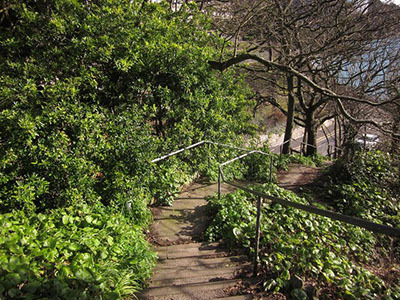 To get an understanding of those early humans visit Kent's Cavern which is also a gateway to the Torbay Global Geo Park.